Boston, May 29, 2015, — Prof. Brian Kobilka, 2012 Nobel Prize winner in Chemistry, recently attended Tongji Medical Forum in Wuhan, China. As an Honorary Professor at Tongji Medical College of Huazhong University of Science and Technology(HUST), Prof. Kobilka delivered a lecture on his groundbreaking research on G-protein-coupled receptors to hundreds in the audience. Prof. 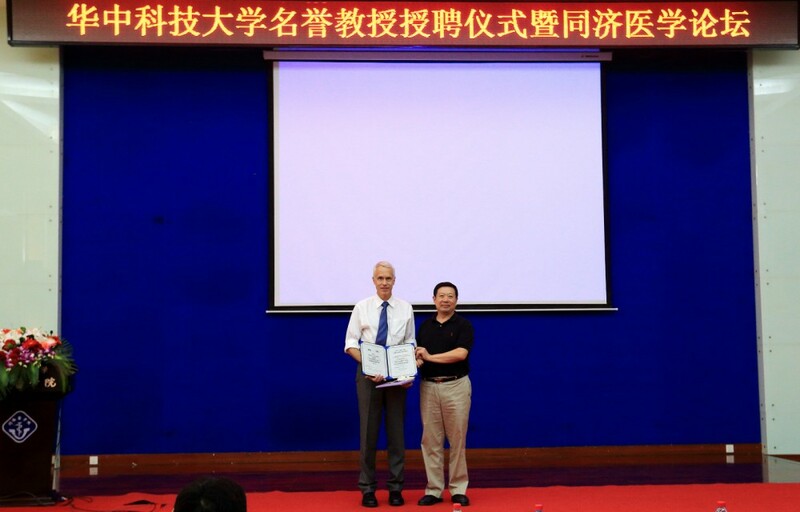 Laureate (left) receives Honorary Professor certificate at Tongji Medical College (provided to bostonese.com). The title of the lecture is Structural insights into the dynamic process of G protein coupled receptor signaling. Prof. Kobilka answered questions from the audience patiently after the lecture. The following is a short summary on this topic. G-protein-coupled receptors, or GPCRs, which snake in and out of the cell membrane, serve as one of the main methods of communication within the body — conveying chemical messages into the cell’s interior from outside through the membrane. Roughly 800 different GPCRs have been identified to date, making them one of the largest families of human proteins. These proteins regulate the beating of our hearts, the workings of our brains and nearly every other physiological process. About 40 percent of all medications target these receptors, including Zyprexa, which is used to treat schizophrenia; the antihistamine Clarinex; and Zantac, which is used for stomach ulcers and gastro-esophageal reflux disease. GPCRs are also involved in some kinds of drug addictions, such as addiction to morphine and other opiates. GPCRs conduct the majority of transmembrane responses to hormones and neurotransmitters, and mediate the senses of sight, smell and taste. The b2 adrenergic receptor (b2AR), the M2 muscarinic receptor and the mu-opioid receptor are prototypical Family A GPCRs. Recently the Kobilka lab has obtained three-dimensional structures of these receptors in inactive and active conformations, as well as a structure of the b2AR in complex with the G protein Gs. Comparison of these structures provides insights into common mechanisms for propagation of conformational changes from the agonist binding pocket to the G protein coupling interface. The lab has used fluorescence, EPR and NMR spectroscopy to study the dynamic properties of the β2AR. Professor Kobilka will discuss what these studies have taught us about allosteric regulation of GPCR structure by G proteins and ligands. Brian Kobilka just turned 60 in May this year. He won the 2012 Nobel Prize in Chemistry with Robert Lefkowitz for his work on GPCRs. He is currently a professor at the department of Molecular and Cellular Physiology at Stanford University School of Medicine. Prof. Kobilka’s laboratory has determined the molecular structure of the β2-adrenergic receptor. This work has been highly cited by other scientists because GPCRs are important targets for pharmaceutical therapeutics, but notoriously difficult to work with in X-ray crystallography. Before, rhodopsin was the only GPCR where the structure had been determined at high resolution. The β2-adrenergic receptor structure was soon followed by the determination of the molecular structure of several other G-protein coupled receptors.